Haarlemmermeer [ˌɦaːrlɛmərˈmeːr] ( listen) is a municipality in the Netherlands, in the province of North Holland. It is a polder, consisting of land reclaimed from water, and the name Haarlemmermeer means Haarlem's Lake, still referring to the body of water from which the region was reclaimed in the 19th century. The original Haarlemmermeer lake is said to have been mostly a peat bog, a relic of a northern arm of the Rhine which passed through the district in Roman times. In 1531, the original Haarlemmermeer had an area of 26.0 square kilometres (10.0 sq mi), and near it were three smaller lakes: the Leidsche Meer (Leiden Lake), the Spiering Meer, and the Oude Meer (Old Lake), with a combined area of about 31 square kilometres (12 sq mi). The Haarlemmermeer could be a dangerous place during storms. It claimed a famous victim on 7 January 1629, when Frederick Henry of the Palatinate, son and heir of Frederick V, the "Winter King" drowned trying to cross it. First, a canal was dug around the lake, called Ringvaart (Ring Canal), to carry the water drainage and boat and ship traffic which had previously gone across the lake. This canal was 61 kilometres (38 mi) long, and 2.40 metres (7.9 ft) deep, and the excavated earth was used to build a dike from 30 to 50 metres (98 to 164 ft) wide around the lake. The area enclosed by the canal was more than 180 square kilometres (69 sq mi), and the average depth of the lake 4 metres (13 ft). As the water had no natural drainage, it was calculated that probably 1000 million tons of water would have to be raised by mechanical means. All of the pumping was done by steam mills, an innovation contrasting with the historic practice of draining polders using windmills. Three Cornish beam engines were imported from Hayle: the Leeghwater, the Cruquius (the largest Watt-design reciprocal stroke steam engine ever built and now a museum), and the Lijnden. Pumping began in 1848, and the lake was dry by July 1, 1852; 800 million tons of water were actually discharged. At the first sale of the highest lands along the banks on 16 August 1853, about £28 per acre was paid; but the average price afterwards was less. The whole area of 170.36 square kilometres (65.78 sq mi) recovered from the waters brought in 9,400,000 guilders, or about £780,000, exactly covering the cost of the enterprise; so that the actual cost to the nation was only the amount of the interest on the capital, or about £368,000. In 1854, the city of Leiden laid claim to the possession of the new territory, but the courts decided in favor of the nation. Haarlemmermeer became incorporated as a municipality in the province of North Holland by law on July 16, 1855. Its first mayor was Matthijs Samuel Petrus Pabst [nl]. The first church was built in the same year and by 1877 there were seven. By 1860 its population was 7237, and 40 years later in 1900, it was 16,621. On 1 January 2019, the municipality of Haarlemmerliede en Spaarnwoude merged with Haarlemmermeer. The municipality of Haarlemmermeer consists of the following cities, towns and villages: Aalsmeerderbrug, Abbenes, Badhoevedorp, Beinsdorp, Boesingheliede, Buitenkaag, Burgerveen, Cruquius, De Hoek, Haarlemmerliede, Halfweg, Hoofddorp, 't Kabel, Leimuiderbrug, Lijnden, Lisserbroek, Nieuwe Meer, Nieuwebrug, Nieuw-Vennep, Oude Meer, Penningsveer, Rijsenhout, Rozenburg, North Holland [nl], Schiphol, Schiphol-Rijk, Spaarndam (partly), Spaarnwoude, Vijfhuizen, Vinkebrug, Weteringbrug, Zwaanshoek, Zwanenburg. Stelling van Amsterdam – the old defense line of Amsterdam crosses the Haarlemmermeer. Plans are being made to make this entire defense line walkable, but currently it is not possible to cross the major highway A4 that goes through it. This park is accessible at various points for recreation, including the Haarlemmermeer Woods. Haarlemmermeer Woods (Dutch: 'Haarlemmermeerse Bos') – the largest public park in Haarlemmermeer and site of the International garden show Floriade 2002, the park includes a large lake for swimming in the summer and a 40-meter manmade hill called Spotter's Hill. The Haarlemmermeer Woods is home to events such as horse shows and the Mysteryland music festival. 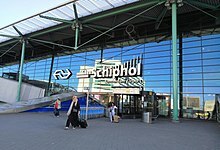 Nederlandse Spoorwegen, the Dutch National Railways, serves the municipality with three stations: Hoofddorp, Nieuw-Vennep, and Schiphol Airport (which serves high speed rail as well). To honour the relationship, three structures in Hoofddorp are named after the sister cities: The Cebu Citybridge and the Hódmezővásárhely fountain. ^ "Burgemeester Onno Hoes" [Mayor] (in Dutch). Gemeente Haarlemmermeer. Retrieved 4 March 2014. ^ "Postcodetool for 2132TZ". Actueel Hoogtebestand Nederland (in Dutch). Het Waterschapshuis. Retrieved 4 March 2014. ^ Encyclopædia Britannica. 12 (11th ed.). Cambridge University Press. pp. 781–782. ^ "Gemeentelijke indeling op 1 januari 2019" (in Dutch). CBS. Retrieved 1 January 2019. ^ "TUI Nederland". Tui.nl. Retrieved 2013-09-27. ^ "94". Flightglobal.com. Retrieved 2013-09-27. ^ "Visiting address and directions". Transavia.com. Retrieved 2013-09-27. ^ "WTC Schiphol Airport". Wtcschiphol.nl. Retrieved 2013-09-27. ^ "Contact". Schiphol.nl. Retrieved 2013-09-27. ^ "NCA - Nippon Cargo Airlines | NCA Worldwide Offices (Europe)". Nca.aero. Retrieved 2013-09-27. ^ "Contact | Corendon Dutch Airlines". Corendonairlines.nl. 2013-01-18. Retrieved 2013-09-27. ^ "Corendon Airlines". Corendon Airlines. Archived from the original on 2013-10-29. Retrieved 2013-09-27. ^ "578". Flightglobal.com. Retrieved 2013-09-27. ^ "1968 | 0895 | Flight Archive". Flightglobal.com. 1968-06-06. Retrieved 2013-09-27. ^ "1997 | 0812 | Flight Archive". Flightglobal.com. Retrieved 2014-03-25. ^ "Air holland: Contact - Hoofdkantoor". Web.archive.org. 2003-04-08. Archived from the original on December 3, 2003. Retrieved 2013-09-27. ^ "1452". Flightglobal.com. Retrieved 2013-09-27. ^ A-770. Books.google.com. Retrieved 2013-09-27. ^ "FINAL REPORT 97-74/A-25 PH-KHB, Sikorsky S-76B 20 December 1997, near Den Helder" (PDF) (in Dutch). Onderzoeksraad.nl. Archived from the original (PDF) on 21 February 2012. This article incorporates text from a publication now in the public domain: Chisholm, Hugh, ed. (1911). "Haarlem Lake" . Encyclopædia Britannica. 12 (11th ed.). Cambridge University Press. pp. 781–782. Garritsen, A.M. Pyttersen's nederlandse almanak. Bohn Stafleu Van Loghum [nl], 1998.